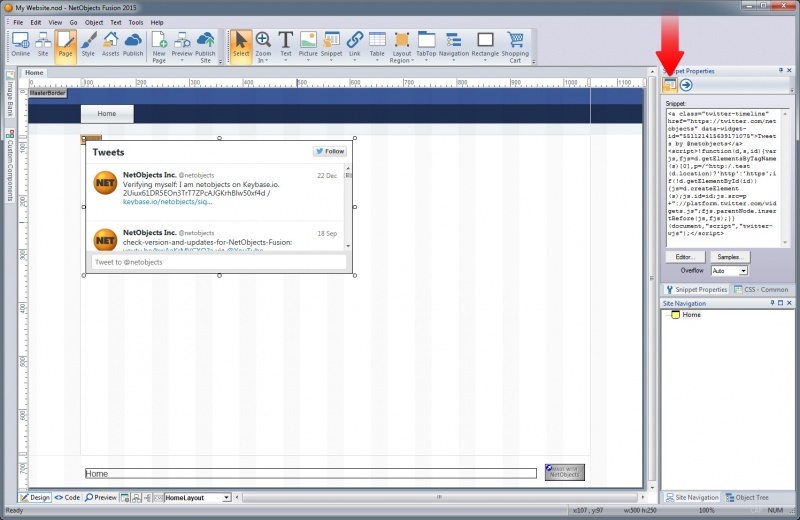 The NetObjects Fusion Snippet Component is a Powerful new tool designed to dramatically improve the way you work with embedded HTML through the software. The Snippet Component takes the guesswork out of how your embedded code from third parties such as Twitter and Google Maps, will render. Some “snippets” require a remote publish to render due to safety precautions. This is not controlled by NetObjects Fusion. If your embedded component is not showing in the Page view, try publishing it remotely to see if it works. The new NetObjects Snippet tool is exceptionally powerful. With the ability to embed services from a plethora of websites you can now provide music lists, maps, and feeds, all shown in real time through the NetObjects Fusion Page view. In Page view, select the Snippet tool from the Standard Toolbar. Draw a box to indicate where you want to position the snippet. Snippet - Paste your code snippet here. Editor - Some snippets require some code to be placed in between the <head> tags and another in the <body>. Use the editor to place these snippets accordingly. Samples - Takes you to documentation and tutorials on the use of the Snippet tool. Overflow - Indicates whether or not generated code will display beyond the boundary box. The Automatic setting let’s NetObjects Fusion choose the appropriate setting. Some embed codes will be smart enough to recalculate sizes based on a variable used in place of fixed sizes. This will allow you to resize the Snippet component and have the rendered code automatically update it’s size. You can replace the width and height of the embed code with the NetObjects Variables of $NOF_WIDTH and $NOF_HEIGHT. This will force smarter components to resize automatically to the dimensions of the Snippet component box in the Page view. Please see the example below. Adding PayPal buttons to your website is one of the easiest ways to start selling your products or services online, especially for smaller online stores. With the NetObjects Fusion Snippet tool we’ve made it easier than ever to include them in your website. Once you have selected the type of button you would like to add, click the Customize & Preview option. The Customize & Preview dialog appears. You are now provided the code snippet and a preview of your button. Open NetObjects Fusion 2015 to the Page view. Select the Snippet component from the Standard toolbar and draw a box to indicate the Snippets location on the page. Paste the code from PayPal into the Snippet field. Click away to refresh the page. Adjust the snippet box as needed. Engage with your visitors by offering a detailed map of your location, event or any other physical locale required. A map encourages interaction and important dialog with your customers. From https://www.google.com/maps type in the address you wish to show on your website. Once you have located the address in the map, click the cog icon and select Share and embed map. Click the Embed map option. Select the size of the map you wish to display. NetObjects Tip: You can replace the width and height of the embed code with the NetObjects Variables of $NOF_WIDTH and $NOF_HEIGHT. This will force the map to resize automatically to the size of the Snippet Component box in the Page view. Please see the example below. Paste the code from Google into the Snippet field. From http://www.bing.com/maps type in the address you wish to show on your website. Once you have located the address in the map, click the Share link. Click the Customize and preview button. The Customize embedded map dialog appears. Select the size of your map you wish to display. Click the Generate code button. Paste the code from Bing into the Snippet field. Twitter is a great way to connect with your audience in bite size chunks. Use twitter to share information, gather intelligence, and engage your audience. You can embed twitter timelines of any public account. This guide will use @twitterdev for examples. Navigate to https://twitter.com/twitterdev If you are not already logged in to Twitter, you will be prompted to, do so. Click the cog icon next to the Follow button. The Create a user widget dialog appears. There are several options you can configure in the Twitter widget, for a complete list visit the documentation link above. Configure the Timeline widget as needed. Paste the code from Twitter into the Snippet field. Add a Skype button to your website that let’s visitors contact you or your business by clicking the button. This works on desktop and mobile browsers. Navigate to http://www.skype.com/en/features/skype-buttons/create-skype-buttons. Fill out the fields as needed. You have the option to enter your Skype Name, whether to Call, Chat or both, and color and dimensions of your button. Configure the Skype widget as needed. Paste the code from Skype into the Snippet field. You can embed individual songs and follow buttons. You can use the same basic steps below for the web player. NetObjects Tip: Spotify will prompt a user to login before being able to use the service. Search for the song you would like to embed. Right click the song and select Copy Embed Code. Add a Snippet Component to your page. Paste the code from Spotify into the Snippet field. Search for the artist you would like to include a share button for. Paste the URI code to the appropriate field. Configure the remaining options as needed. SoundCloud is a distribution platform for streaming content on the web. Share content with your site visitors with an easy to configure web app and NetObjects Fusion snippet widget. Configure the embed code as needed. Paste the code from Soundcloud into the Snippet field. Search for the channel you would like to embed. Vine allows users to record and edit looping video clips up to six seconds long, and share them with followers. From https://vine.co search for or locate a vine you wish to show on your website. Once you have located the video, click the vertical ellipses and select Embed. Configure the options available to you. Paste the code from Vine into the Snippet field. The following embeds work on Publish but not in Page view. Add important Facebook posts to your website to keep your visitors in-the-know about your website and activities. You can get the embed code directly from any public post. Click on the icon that appears in the top right corner of the post. NetObjects Tip: You can replace the width of the embed code with the NetObjects Variables of $NOF_WIDTH. This will force the post to resize automatically to the width of the Snippet Component box in the Page view. Please see the example below. Paste the code from Facebook into the Snippet field. Add important Google+ posts to your website to keep your visitors in-the-know about your website and activities. Click on the icon that appears in the top right corner of the post (hover to see the icon). Paste the code from Google+ into the Snippet field. NetObjects Tip: Google+ does not currently support width and height adjustments to your embedded posts. Instagram is a free photo and video sharing application and service. You can upload photos or videos to the service and share them with followers or with groups of friends. People can view, comment and like posts shared by their friends on Instagram. To embed Instagram content you need to first visit the post on the web and get the embed code. Go to the post URL or you can go to http://instagram.com/[username] and then click the post to expand it. Click the more [...] button and select Embed. You have the option to include the caption or not. Click the Copy embed code button. NetObjects Tip: Embedded posts from Instagram are responsive and automatically resize if the embedding container becomes smaller or larger. Find images and videos and pin them on your own personal bulletin board. Emphasis is placed on discovery and curation of other people’s content. To embed a Pinterest board, first visit https://business.pinterest.com/en/widget-builder#do_embed_board. Type or paste in the Pinterest Board URL. Select the type of widget you would like to use. Click the Build It! button. Copy the code that is generated. Paste the code from Pinterest into the Snippet field. LinkedIn is a business-oriented social networking service. Connect with professionals around the world and network for success and productivity. Enter your public profile URL. Choose to show or hide connections. NetObjects Tip: You can add a variable for width to the embed code using $NOF_WIDTH. This will force the post to resize automatically to the width of the Snippet Component box in the Page view. Please see the example below. Paste the code from LinkedIn into the Snippet field. This page was last modified on 13 January 2015, at 22:44. This page has been accessed 39,803 times.